Your comment is our way to continue to improve our product. Do you know if they are DTP or not ? Yes. This DTP Copper PCB. It was great to review a quality product , it is a very good C8 . Thanks too. I had added the new stocks. If you are looking for a neutral white 5000K XHP35 HI this is the one to get. To my eyes it a perfect neutral white, no hint of blue or green. I don’t have any way to measure output but for this kind of tint I will gladly take a lower output. Thank you Kaidomain for a very nice product and the shipping was fast too only 12 days to Denmark from the day I placed my order. Just need a better tint. You can enjoy 10% off dicount of ANY order. We will keep to offer more discount items. Thanks for your supporting to us. Nice! I’m curious how the XP-L2 beam is in a reflector light! I’m not sure how the obtainability is Ban, but on the forum there is quite a few folks interested in higher CRI versions of Cree leds, like the XHP leds and other Cree leds. Intl-outdoor has run out of many 80CRI versions and it has been a long time since Hank listed new leds. A selection of well known CREE LEDs (XHP35/50/70 , XM-L2 , XP-L HD/HI) in various color temperature in 80+/90+ CRI would sell very well here ! We will keep to see any higher CRI available from our supplier. Nice to see 80CRI Cree’s ! BanL, I see that you sell leds on 16mm, 20mm, and 20mm triple copper DTP-boards. The 16mm board is for sale bare without leds, are you going to list the 20mm and 20mmtriple version also without leds? (I like these black boards better than the red Noctigons). Yes. We are starting to solder the LEDs on the 16mm, 20mm and the Triple PCB. It will release within 1 to 2 days. I will help to update those sales links asap. I have one of these but the VN version for considerably more $ than this price. I have to say though, Olight made an exceptionally high quality light with the X7. It has a very durable feel and heat sinks well for the size. I cannot speak to the stock Olight UI as I have the driver VNx2 in my version. Stock is 9,000 lumens vs. 14,000 in VN (ANSI), but in a way this is still negligible difference as to the naked eye even this much of a gap can be mistaken one for the other. Side by side though would be fairly obvious. 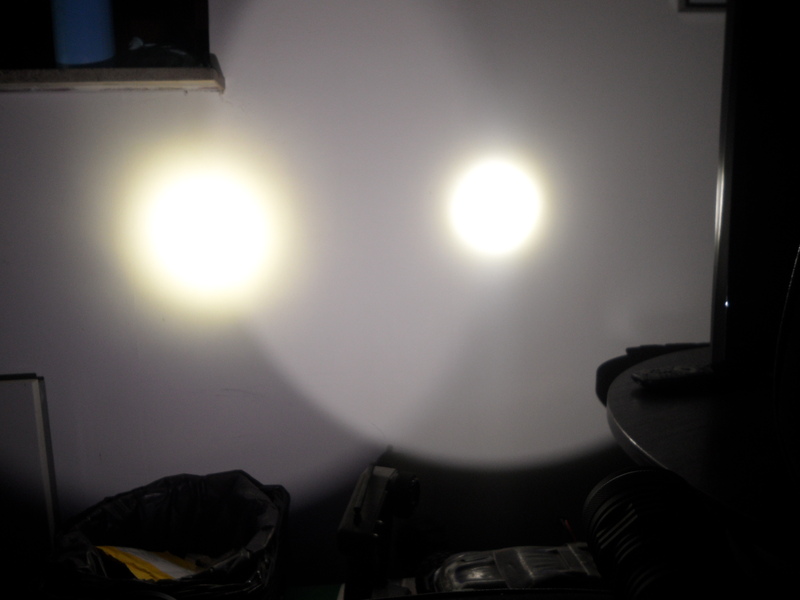 I have to say though, Olight made an exceptionally high quality light with the X7. It has a very durable feel and heat sinks well for the size. Ahhhh, I keep hearing things I want to hear. I used to say ah well X7 it’s not available in NW…. but I can’t say that anymore… I’m still resisting… I am curious about the TM28 you ordered as well IIRC. Are you referring to me as well regarding the TM28 order? Says IIRC? When will you have an HD2010 with XHP35 HI or XP-L2? I’m curious about how people will experience the TM28. I believe I’ve read that you have ordered one. And I’m tempted as well each time I read people say how well built the X7 is. oh, yes that’s right, sorry. I expect to have to wait about two more weeks for that light. I’ll definitely make some sort of review with beamshots, comparisons and post it to the forum. Probably pit it against an Acebeam K60 dedomed, X7VN and stock TK75 (2015) just to see how the beams compare/contrast.